Arthur Grin at HMY Yacht Sales sends news he's listed the 24.3m cockpit motor yacht Nancy V for sale. Built by Ocean Alexander in 2009, she boasts a large saloon with relaxation and dining ares and sleeps six guests in three staterooms - a full-beam master suite, VIP stateroom and twin cabin, all with granite-floored en suite facilities. Features include a fully air-conditioned and heated enclosed flybridge and aft deck, meaning Nancy V is ready to cruise in all seasons. Her twin 1,650 Caterpillar engines are fully warrantied until July 2015. 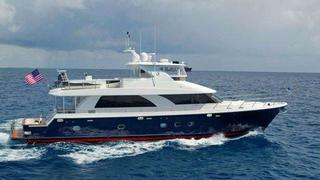 On display at the Fort Lauderdale International Boat Show this October, Nancy V is asking $2,795,000.